A bicycle built for... seven. Mom Emily Finch traded in her Suburban for a custom-built bicycle that she uses to pedal her children, ages 2-11, around Portland, Ore. If a mother of six claimed that her daily workout consisted of wrestling her brood into and out of the family’s Suburban, many of us would say, “nicely done.” After all, getting that many bodies dressed, out the door and buckled in is no easy task. Now, if a mother of six said she had traded in her Suburban for a super-sized bicycle, many of us would say, “What the -- what? !” But that’s exactly what Emily Finch of Portland, Ore. did (somehow we could have guessed she lives in Portland). Emily pedals around Portland in a "bakfiets," which is a cargo bike that looks a bit like a wooden wheelbarrow-bike hybrid. Her younger children, ages 2-9, ride in various carriers and seats, while her 11-year-old son usually follows behind on his own bike. This incredibly fit and impressive mom goes everywhere on her bike – she has to. She sold her SUV before moving to Portland. 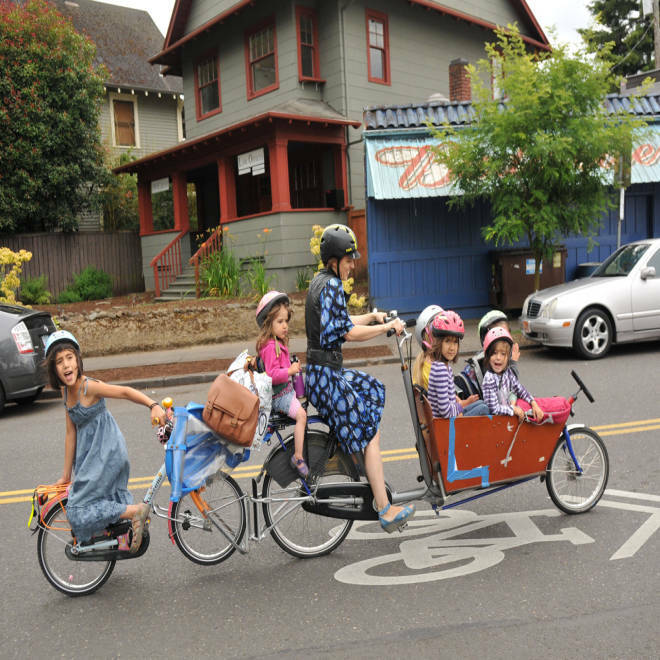 As BikePortland.org reports, this gal isn’t just pedaling a lot of little people around. As we know, children do not travel light. Between the bike, the kids, their gear and the groceries, she’s often carting about 550 pounds. And, she does it all wearing open-toe wedges. Color us impressed. "I started looking at my life... I was living in a giant house and had a nine-person Suburban. I remember thinking, there's no reason I can't walk or bike around town," Emily told BikePortland.org. "I was at a time in my life when something had to change," she said, "When I saw that bike, I knew it. I said, 'This is it. This is going to change my life.'" Emily hadn’t even biked much as an adult and was pregnant with her sixth child when she ordered her bakfiets. Although it was a struggle at first, she kept with it. As she gained strength and momentum, she also found she gained a newfound happiness from riding the bike. She didn’t just gain, she also lost – 25 pounds. That’s not to say it’s all biking bliss in her family. When siblings squabble in a car, windows can be rolled up and outsiders don’t usually witness the bickering. When siblings bicker in an enormous bike contraption, everyone’s bound to see because they’re out there in the open, in an eye-catching barrow. Despite the drawbacks, this biking mama has got to be an inspiration to the rest of us. Dana Macario is a Seattle-area mom who’s pretty sure her bike has a flat tire.